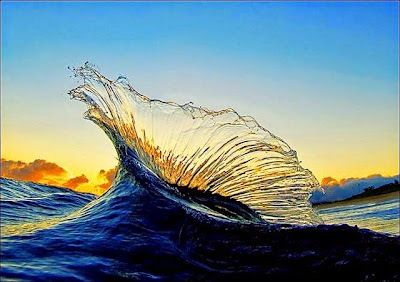 Photo of Hawaiian waves (c) by Clark Little . In the ancient world, certain natural materials commanded a premium and rock crystal was among the most coveted. Large completely transparent crystals of quartz were found in caves and glacial moraines and craftsmen managed to work them into exquisite cups, vessels and ceremonial objects. By the time the Renaissance arrived, the demand for rock crystal drove much of the innovation in glassmaking. Indeed, clear glass was very much sought after and thought of as an artificially produced form of rock crystal. A standard line in the historical narrative tells that the ancient Greeks believed that rock crystal was a form of solidified water, the word “krystallos” meaning ice. Enough written material survives from the likes of Herodotus, Pliny, Seneca and Saint Jerome to know for certain that one version or another of this idea has been around for a few thousand years. It is a line that usually gets attention for all the wrong reasons; when stated so glibly, it does not throw any light on ancient culture or our connection to it and worse, it plays into the fiction that we are somehow very much more astute than our relatives of 150 generations ago, that our progenitors were quaintly uninformed. Instead, think of “solidified water” as part of a working model of the world. It was consistent with the prevailing conception of nature in the same way that, for modern physicists, eleven-dimensional string theory serves; it seems to be correct, to the best of our knowledge, but the chances are good that there is more to the story yet to figure out. Like string theory, solid water is not a concept that would have a strong bearing on the daily lives of most people. For specialized artisans, it did make good sense; to thinking of rock crystal in this way would be a reminder that if treated too roughly, the material would shatter into pieces as if it were ice. In the fifteenth century, the Venetian island of Murano became the center of the universe for glassmakers, and it stayed that way for the next four centuries. Of all the many forms that glass can take, the one that made Murano most famous was cristallo; named after the mineral it so closely imitates. The genius of cristallo was in bringing together diverse techniques and ingredients to form a product that was clear like water, yet could be worked thinner and in more complex designs than was possible with carved rock crystal. The hallmark of cristallo was the specific use of Levantine soda ash and white quartz river stones (tarso) as opposed to sand and it became the pinnacle of the glassmaker’s art. For the first time, artisans combine best practices with premium raw material sources, the extra purification steps, the careful avoidance of iron contamination, the hot glass washing process, the clean burning hardwood fire and the manganese color correction. In Venetian furnaces, even the clay for the crucibles was a special product imported from Constantinople, which did not contaminate the melt. In 1450 the Christian world was dealt a severe blow by the Byzantine Empire’s fall to the Ottomans and with it went the Venetian’s major trading partners. That same year, the Murano glassmaker Angelo Barovier is given credit for the development of cristallo. He was the man responsible for bringing together the ultimate refinements that elevated glass to a new level of perfection and created a national product for Venice when they sorely needed it. These techniques and materials were all available and utilized by glassmakers individually at least fifty years earlier, but not together in a single product. Barovier had attended lectures by noted alchemist Paola de Pergola, at the School of Rialto. This indicates that he was thinking along the lines of a chemist in putting together a repeatable regimen for an exceptionally clear, bright, workable product. Barovier’s innovation would become a tradition that was carried on by countless glassmakers and ultimately by our Florentine priest Neri more than a century and a half later. In seventeenth century Florence, Grand Duke Cosimo I de' Medici negotiated for Venetian masters to teach and practice their coveted techniques in Tuscany. Royal architect and polymath Bernardo Buontalenti was credited with the development of an artificial rock crystal, Tuscany’s own version of cristallo. It is an open question whether we see his hand in Neri’s recipe number seventy-six in which actual precious rock crystal is crushed and used as raw material for glass. In any case, Buontalenti’s continued presence at the Casino must have been an influential experience for his former pupil Don Antonio de' Medici, Neri’s sponsor. Our glassmaking priest was impressed enough with this technique to use rock crystal as the basis for his artificial gems. 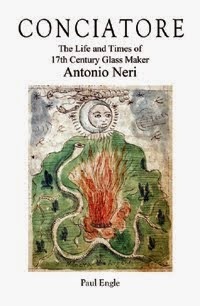 In turn, Neri’s chapter on artificial gems received the most attention, by far, of any other single subject in his groundbreaking book on glassmaking, L’Arte Vetraria. His work on this subject took on a life of its own and was the subject of plagiarism and unattributed derivative works well into the nineteenth century. An argument can be made that his lead glass based gems fueled the revolution pioneered by English glassmaker George Ravenscroft in what has become the current pinnacle of clear glass: lead crystal.